← Saying of the day: Short of words? Interactions with His Holiness Indradyumna Maharaja. At the New Govardhana ISKCON Australia, Hare Krishna Easter Holy Name Festival 2016, I was clapping my hands during His Holiness Indradyumna Maharaja’s Srimad Bhagavatam class’ introductory kirtan and was quite absorbed in the chanting, when I felt some slight rub in my back. I thought: “O some devotee moving around in the crowd. Nothing to be noticed.” When the rub repeated itself, I turned around to see what was happening. His Grace Sakhi-rai Prabhu was indicating to me that I should stop the clapping and that was quite a hit. I did however stop the clapping, especially when I noticed that the message was actually coming for HH Indradyumna Maharaja himself, who was on stage, playing the harmonium. “It was too fast.” was the answer. Coming from such a seasoned musician and kirtan leader, I had no choice but to accept the verdict. We smiled and even laughed. If my memory serves me well, it was some years ago at a Brisbane Sunday Feast at the now abandoned Elisabeth st. facility that he told me the very same thing: “Too fast”. I was then playing the kartals and Maharaja was again playing the harmonium. He gracefully added: “It’s your passion to go Back Home, Back to Godhead”, which denotes the positive and Krishna conscious way to look at the situation and represents in fact a compliment. Thank you very much Maharaja! This principle applies especially in the relationship between spiritual master and disciple or teacher and student. Srila Prabhupada also calls it “functional devotional service”, as per quote below. But in the realm of devotional service, anyone who teaches us even one single thing properly, according to parampara, either philosophical or practical, as well as unknown to us and therefore new, is factually acting as instructing spiritual master or “siksha guru.” This is the great benefit of sadhu sanga! 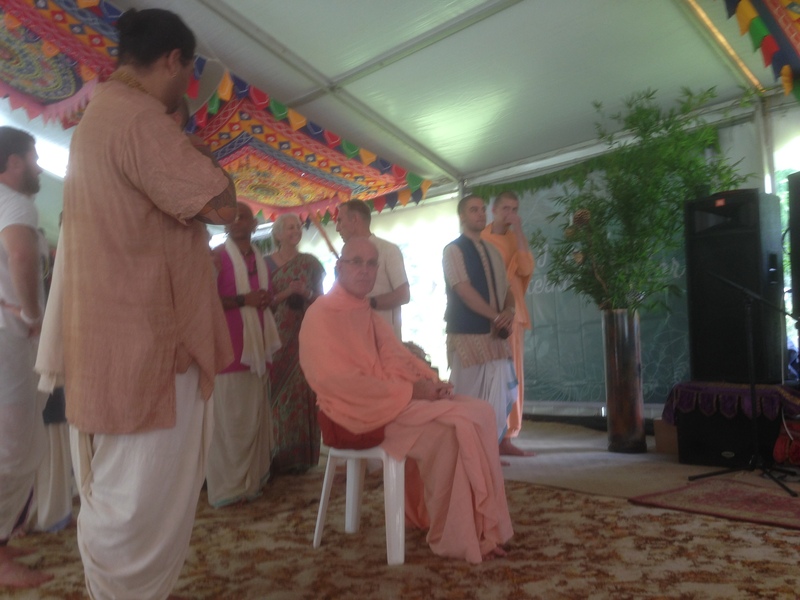 HH Holiness Indradyumna Swami is actually trying to help me temper my kirtan participation. I am thankful and indebted to him. A very advanced soul sees the teachings of Krishna, the primeval spiritual master, all around him. This is explained in Srimad Bhagavatam, Canto eleven, Chapter eight titled “The story of Pingala” and elsewhere. All glories to His Holiness Indradyumna Maharaja! All glories to the assembled devotees, especially those lucky devotees who attended the ISKCON Australia Easter New Govardhana, Holy Name Festival 2016 and also those who will attend the US equivalent at Boone, North Carolina USA, on May 27th to May 30th 2016. Please see sadhusangaretreat.com for further info.